As a parent nothing is more important than keeping your baby safe. It’s a task that seems like it should be easy, but it can feel overwhelming when you start thinking about all of the dangers your baby might face, no matter how unlikely they may be. September is Baby Safety Month and was created to bring awareness to parents to help them make good choices in the products they purchase for their children. As dentists, we are a part of child’s health care provider team and your baby’s safety is important to us too. So, we present you with a few baby safety tips. Along with a new baby comes a wide variety of baby products – cribs, changing tables, strollers, baby carriers and so much more. Choosing the perfect baby product can be fun, but should also include some careful thought. Check out this list of tips for choosing and using baby products. It’s important to follow manufacturer recommendations for age and use to prevent injury. When offered, register your product so you can be alerted in the case of a recall. If you purchase products secondhand, it is always a good idea to check on any existing recalls. Bookmark this page for safety recall information. Child proofing your home doesn’t need to be excessive or expensive. Look around from the point of view of your child for things that can be choking hazards, trip, strangle, falling or tipping hazards. Some are obvious like electrical sockets and the cords for blinds, but others aren’t so obvious like long tablecloths, furniture that could tip and laundry pods. 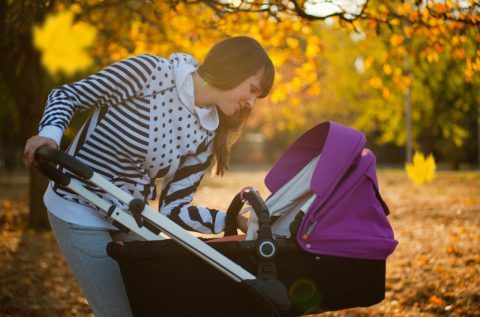 Remember, child proofing is an ongoing task as your baby grows and becomes more mobile. For a robust list, check out this resource for all kinds of baby safety tips. Regular Health Care Visits – keeping your baby safe includes keeping them healthy. Make sure you visit your pediatrician regularly to make sure your baby’s development is on track. Check out this schedule for well-child visits. Part of their health care routine should include regular visits to the dentist. Schedule their first dental visit within six months of the eruption of their first tooth or by their first birthday as recommended by the American Academy of Pediatric Dentistry. 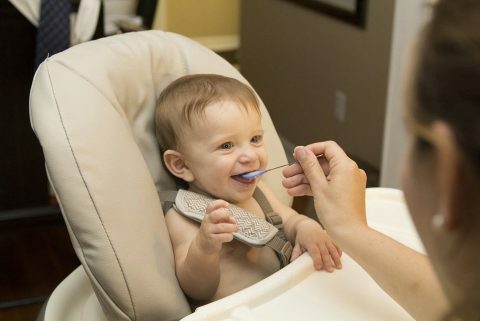 Keep Your Utensils Out Of Their Mouths – babies love to explore the world with their mouths, but putting things in their mouths exposes them not just to choking hazards but to all kinds of germs. But most parents don’t think twice about sharing spoons or straws with their baby. Don’t do it!. Cavities are created from bacteria, and the cavity-causing germs in a parent’s mouth can be transferred to baby’s! Clearly this list isn’t all inclusive, for more baby safety tips visit the American Academy of Pediatrics and WebMD for their guides to baby safety. Before you know it your baby will have grown into a busy toddler and you’ll have a new set of challenges ahead of you. And while we can’t help with all of those challenges, we certainly would love to help you keep your childrens’ mouths healthy. Find a PERFECT TEETH dentist in your area online or call 844-717-9588 to make an appointment today! Affordable treatments and insurance options are available.